When people hear about Invisalign for the first time, they’re really taken by surprise. This causes them to ask your dentist many questions. Whether you aren’t sure if you can eat and drink while wearing aligners or you don’t know how long treatment will take, your dentist does his best to give patients accurate expectations. We hope that after reading this FAQ about Invisalign in Bixby, you’ll be better equipped to have your consultation and start your path to straighter teeth! Invisalign uses controlled force to shift teeth into a healthier and straighter position. With targeted timing, only certain teeth will shift based on the aligners that you’re wearing. These movements are predetermined during your consultation, so your dentist will always know if something wrong is going on and be able to make adjustments as needed. Treatment time can vary based on how complex the orthodontic case is, as well as how often a patient wears their clear aligners. On average, treatment takes anywhere from 12 to 18 months to complete. Adult cases tend to take about 12 months whereas teen cases can vary. Your dentist cannot stress enough how important it is that you wear your aligners for as long as possible. Ideally, you should be wearing them for a minimum of 22 hours a day, only removing to eat, drink liquids (plain water is fine while wearing aligners) or practice oral care. Wearing them for less time will dramatically influence the length of your treatment, so it’s essential to stay committed to wearing them during the day and while asleep at night. Can I Drink, Eat, Chew Gum, or Smoke While Wearing Aligners? The thermoplastic aligners use is durable, but not durable enough to experience daily wear and tear that comes with chewing food. Any time you have a meal, you should be removing them and placing them in their designated carrying case. Chewing gum is also not advised as it can easily stick to the aligners. Plain water is fine to drink, but any other beverages (hot or cold) should be avoided, particularly if they are colored in any way. Their pigmentation can easily stain your aligners, making them more noticeable. Smoking or using any tobacco products will most likely stain the aligners, reducing their transparent appearance. 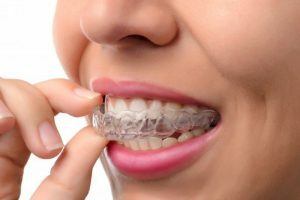 Your dentist in Bixby advises patients to rinse their aligners every time they remove them and before they wear them again. He also recommends you sanitize them once a day with a denture cleanser or with Invisalign’s cleaning crystals. Avoid using toothpaste or colored/scented soaps as this can stain, scratch or give them an unpleasant aftertaste. Have more questions about Invisalign in Bixby? Feel free to schedule an appointment to get them answered today! Dr. Parnam Mohanna has been working in the dental industry for over 26 years. Since earning his dental degree, he’s continued his education in many facets of dentistry, including the use of Invisalign. To learn more about cosmetic treatments, contact him through his website.